This Moist Vanilla Layer Cake is just what it sounds like – a moist, soft vanilla cake that is the newest addition to my library of vanilla recipes. 🙂 It’s delicious and easy to make too! So it’s basically a running joke with a few friends, my mom and the hubs that vanilla cake is like my obsession. At this point, I have a handful of vanilla cake and cupcake recipes and I won’t pretend that I won’t have another at some point. It could totally happen. Vanilla is like the most illusive and yet basic and important of all the cake land. I wouldn’t declare it my favorite flavor, but it’s super important to have a good vanilla base in your repertoire and most people have trouble finding one they like. It’s basically become my life’s mission to have a vanilla recipe for everyone. And since nobody can agree on a “best” vanilla cake (just read the comments on my other vanilla cake/cupcake recipes and you’ll see what I mean), I have several options. This new one is based on feedback from the others. The very first vanilla cupcake was this one, almost 4 years ago. Crazy! There are hundreds of comments and most people love them, but there are some that don’t. You can sometimes get little chunks of butter in them (which is actually fine) and they are a little denser than some expect. But they are super straight forward to make, always turn out and delicious, in my opinion. However, they are on the denser side, especially when made into a cake. So then I shared this vanilla layer cake. It’s a super light cake, has a nice fluff factor and again is nice and moist. This cake has been a long standing vanilla cake around here and for the most part satisfies. It’s not that fabulous as a cupcake though, in my opinion. Not one to be a quitter as far as finding the one recipe above them all, I shared this one – my Favorite Moist Vanilla Cupcake. I’m still a major fan of this cupcake and it’s been my go-to for some time now. Moist, fluffy, flavorful, my love. You can find it in various forms around the blog – both as a cake and as cupcakes. It’s near and dear to my heart, but alas still not all are satisfied. So what’s different about this cake, you ask? Great question! First, most of the other recipes use just egg whites. This one, when made as a cake, uses six. That’s very sad for the yolks that are left on the sidelines wondering what they did wrong to not get picked as players in the cake-making game. So this cake uses whole eggs. Plus, lots of people aren’t into sour cream. Who knew?! I personally love the flavor and moisture it adds to cake, but I omitted it from this one for those are aren’t into it. It’s all about the milk in this cake! This cake also uses butter with a little bit of oil. Oil vs butter can be a touchy topic with strong opinions, but this one is the best of both worlds. Overall, I love a butter-based vanilla cake. But there’s no denying that the oil adds some nice moisture so there’s a touch of it in here for a nice mix of the two. And finally, the mixing method is somewhat simplified. It still uses the creaming method, so it’s not as easy as the throw-and-go style of some of the other options, but there’s a few less steps and such. I also tested this cake as cupcakes and they turn out just as delicious – which is a wonderful thing. Any time you have a great vanilla recipe that works as both a cake and a cupcake, it’s a big win. It’s hard to describe exactly how all these versions are different, but I’ll say that this one is a nice blend of things that people like and dislike about some of the others. The final cake is moist, super soft and delicious, with relatively straight forward ingredients and method. It’s a winner in my book, so I hope you enjoy it! And if you feel so inclined, here are those other cake and cupcake options, if you’d like to try those out. 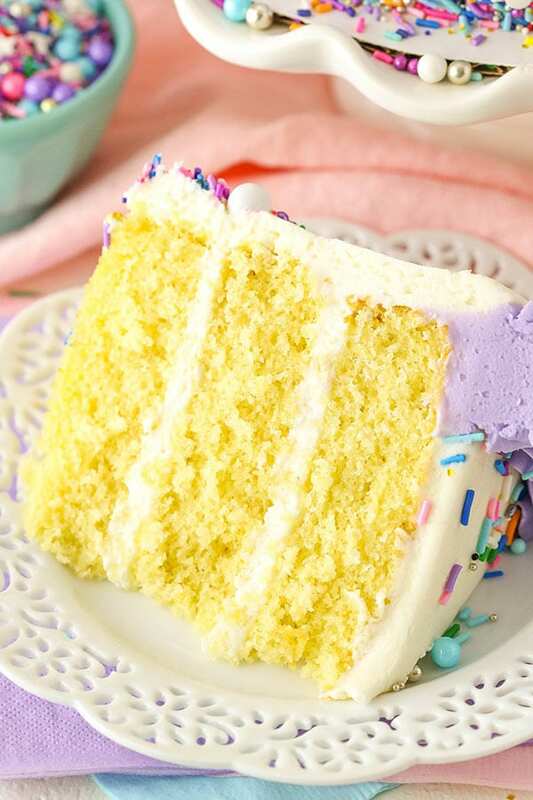 Moist Vanilla Layer Cake is just what it sounds like – a moist, soft vanilla cake that’s easy to make too! 2. Combine the flour, baking powder and salt in a medium sized bowl and set aside. 3. Add the butter, sugar, oil and vanilla extract to and large mixer bowl and beat together until light in color and fluffy, about 3-4 minutes. Do not skimp on the creaming time. 4. Add the eggs one at a time, mixing until mostly combined after each. Scrape down the sides of the bowl as needed to be sure all ingredients are well incorporated. 6. Slowly add the milk and mix until well combined. The batter will look curdled, but that’s ok.
10. To make the frosting, beat the butter and shortening together until smooth. 11. Slowly add half of the powdered sugar and mix until smooth. 12. Add the vanilla extract and 4-5 tablespoons of water or milk and mix until smooth. 13. Slowly add the remaining powdered sugar and mix until smooth. Add additional water or milk, as needed to get the right consistency of frosting. 14. To put the cake together, use a large serrated knife to remove the domes from the top of the cakes so that they’re flat. These cakes don’t have a large dome, but I like to make sure they’re completely flat. 15. Place the first cake on a serving plate or a cardboard cake round. 16. Spread about 1 cup of frosting evenly on top of the cake. 17. Add the second layer of cake and another cup of frosting. 18. Top the cake with the remaining layer and frost the outside of the cake. Refer to my tutorial for frosting a smooth cake, if needed. 20. Color the remaining frosting to your desired shade. I used a mix of purple and cornflower blue gel icing color. 21. Pipe swirls of frosting around the top edge of the cake. I used Ateco tip 844. 22. Add a few more sprinkles to the top of the cake. Store in an air-tight container. Cake is best for 3-4 days. 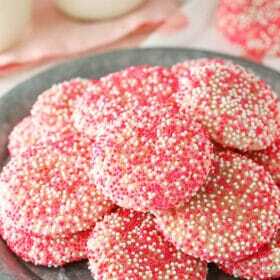 *I used a mix of these sprinkles and ones similar to these. For cupcakes, use the same temperature. Fill cupcake liners 3/4 full and bake for 13-15 minutes or until a toothpick inserted in the middle comes out with a few crumbs. This recipe should make about 24-28 cupcakes. Can you advise how to proceed using two 9inch pans? I made this cake for fourth of July…cake was great, however, the frosting ruined it….is 12 cups of sugar accurate for the frosting? I’m thinking that’s the typo on this recipe that ruined this cake. It’s not a typo. A pretty standard amount of powdered sugar for the amount of butter in a typical american buttercream. However, you can definitely reduce it, if you prefer. cant wait to try this, looks wonderful! my grandson loves vanilla cake. definitely trying this for his birthday. can I ask where you get your sprinkles from? they look so good. There’s a note just below the instructions for the recipe with a link to the sprinkles. They are from Sweetapolita. 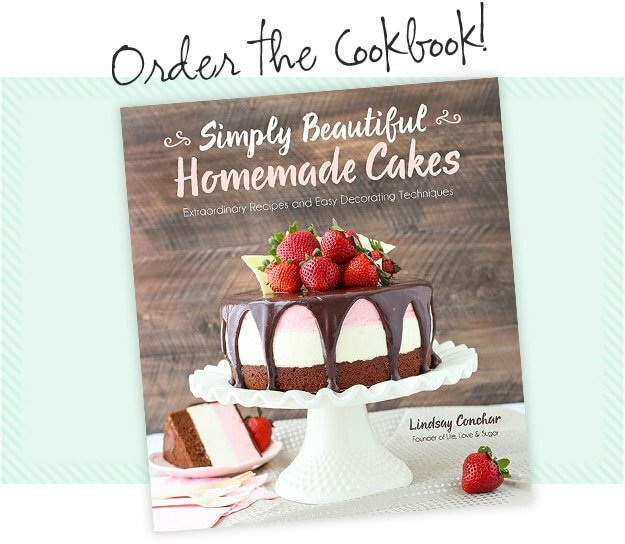 Do you have a recipe for fondant? I didn’t try that yet, but I think it’d be fine. I tried it in a 9×13 and baked for 28-30 mins. Perfection! Baked Saturday evening….all gone Sunday midday. Thank you! Hi Lindsay, I want to make this into cupcakes and I have no vegetable oil!! what can I do? I would really suggest using the oil in these. It was intentionally added for moisture purposes, so without it you won’t get quite the same result. You could certainly try them with all butter, or use one of the other cupcake recipes mentioned above that doesn’t use oil, like this one. the recipe shows 4 eggs. Please advise. Thank you. In the description I believe I mention that a different cake uses 6 egg whites (unless I missed something, which is always possible ???? ). This cake does use 4 whole eggs, as written in the recipe itself. I hope that helps! Sounds delicious! How many cupcakes will this recipe make and could you please suggest a baking time/temp? I’m glad you asked! I meant to add it to the recipe notes, so I’ve updated that. 🙂 Thanks! OMG!!! Lindsay, I know exactly what you mean. I have been baking for about 10 years and every time I feel like I found “the one,” I start looking for another vanilla cake recipe. I am actually on the search right now. I love oil based cakes, because they stay moist for days and even after being put in the fridge, but all oil vanilla cakes taste like nothing but oil! BLECH! I feel like I found the PERFECT vanilla cupcake recipe in September, but when I make it as a cake, it is so dense and heavy. I want something light, fluffy and super moist. I think I am going to try your recipe this weekend. Also, I am going to email you the vanilla cupcake recipe that I really love and have been using for awhile. 🙂 Thank you for your awesome recipes. I really love your recipes and look forward to trying as many as possible! Happy Baking Pretty Lady!! Yes, you get it! 🙂 And I tend to agree about oil based vanilla cake. For chocolate, I’m all in on the oil though. I’ll check out the recipe you sent for sure, thanks! I’ve been in the search for the perfect all oil vanilla cake recipe that stays soft when it’s still cold. I have an amazing all butter vanilla cake that I use for my business but I can’t offer cakes with fillings that need to be refrigerated because butter cakes are so hard when cold. I’d love to try your all oil based vanilla cake recipe. Maybe we can swap? Hi Vanessa, I would love to try your cupcake recipe as well! I’m going to try this one, this weekend! I absolutely love your vanilla cake in your cookbook, everyone raves about it when I make it! 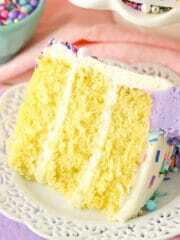 But this one reminds me of the old fashioned yellow vanilla cake. I’m guessing with the yolks it adds more of the yellow color to the batter. I’m going to have to try it, maybe with a chocolate fudge frosting too! I’m also going to have to break down and order those gorgeous sprinkles! The shipping cost just makes me irk every time! 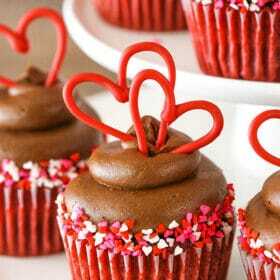 Love your cakes!!! The sprinkles ship from Canada, which is why the shipping is so high. Definitely a bummer. I usually try to meet the minimum for free shipping and just order fun ones to use over a few months. Sometimes you can find her sprinkles in local specialty cake decorating stores. I thought about that, I will save up and do that next time, but I went ahead and ordered the ones you used here and some valentine ones! 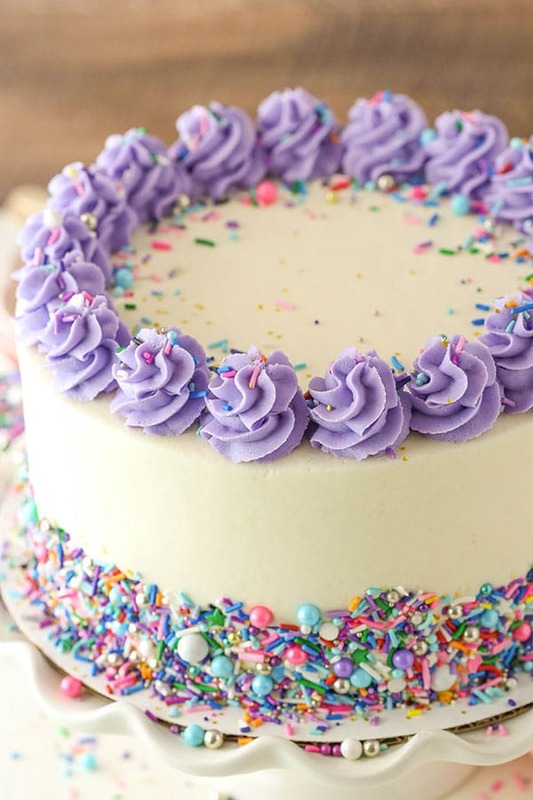 They always look so sparkly and happy and pretty on your cakes!! Don’t know why but I used to love the yellow cake mix boxed cakes with the chocolate frosting as a kid. Something about the buttery moist vanilla-y goodness with the rich chocolate frosting seemed heaven to me! This cake reminded me of that but I KNOW it will be wayyyy better than the boxed mix!! Your vanilla frosting is to die for too! ???? 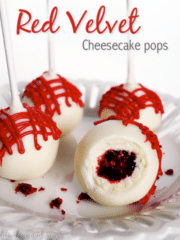 I want to try this because my grandkids love white cake and I haven’t found one I like yet. Does this recipe use 4 or 6 eggs? In the recipe it says 4 but in your description of the cake it says 6 are used? Thanks! In the description I believe I mention that a different cake uses 6 egg whites (unless I missed something, which is always possible 🙂 ). This cake does use 4 whole eggs, as written in the recipe itself. I hope that helps! Oh boy. I can’t wait to try this. I need a foolproof vanilla recipe. I don’t like cake too wet from oil but I’ve never tried butter and oil so I will give it a go! Thank you for the recipe. How can I make this cake eggless?? I haven’t really worked with egg substitutes before, so I’m not sure. I’m sorry! I know your frosting recipe says we can use water or milk, but have you ever tried powdered milk, mixed with water? I think this would enable the frosting to remain unrefrigerated while still using “milk” which is better than using water, I think 🙂 Thoughts? I haven’t used it, but your theory makes sense. Hi Lindsay!! Can’t wait to try this but do you think it’s possible to make it in a 9″ cake pan using the same ingredients? Also, I wanted to let you know that I ordered your cookbook! I’m desperate waiting for it I want it so bad!! 🙂 Thanks for sharing such amazing recipes with us! Yes, a 9 inch should be fine. It won’t be quite as tall, but it’ll be fine. I love the taste and texture of this cake, as does everyone who tastes it, but whenever I make it the bake always comes out with a bubbly sticky top and I don’t get a very good rise. I have my ingredients at room temperature, the oven is the correct temperature, but in my oven I have to bake it for longer than stated. I’ve tried it in two different cake pans and always the same results, any advice? Hmm, I might check your baking powder to be sure it’s fresh and that it’s measured correctly. Also, try not to over mix the the cake batter at the end. When you add the last of the dry ingredients, mix just until it’s all combined. I am trying to make a Boston cream pie. Which of the vanilla cake recipes do you think would work best? Hmm, I’m thinking this one would make a good option actually. I’ve also used the “Favorite Vanilla Cupcake” in a cupcake version of a Boston Cream Pie and it’s always a hit. That would work as a cake option as well. I’ve made the cupcakes. They were well loved. I think I will try this one for a change. Thank you! I just love you girl! I am old enough to be your mother. I have to confess, we are not a cake eating family: pies and cheesecakes are more are thing but your cakes are the bomb! Thank your for your recipes and instructions. Praying for you and your family daily. Please take things easy. Really looking forward to trying this tecipe. But wanted to find out. Can the milk be substituted with buttermilk instead? Then for the milk in mls, 11/4cups should be more than 120mls. Could you please help clarify that? I haven’t tried it with buttermilk to say for sure. Mls have been updated. Thanks! Im on the hunt for a tasty vanilla cake that needs to be made as a semi naked cake. I have no doubt this will be yum, but my question is will the outside be crumbling or does it hold itself nicely to be able to frost and have no crumbs for a semi naked look? I would think it’d be fine. 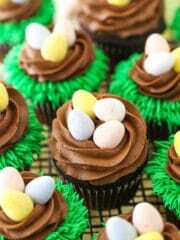 Another option is to use this cupcake recipe and double it for a cake. I’ve used it for a semi naked cake before and it was great. Hi! I love baking your cakes and have made quite of few of them now. Just made this one today! How do you store your cakes? I’m wondering if you can recommend a cake storage container that is tall enough for these layer cakes? I’ve loved all your other recommendations! So thank you! I understand this post is about the perfect vanilla cake but what about the perfect chocolate cake? I was wanting to make a checkered cake for a car racing themed party. Which of your chocolate cake recipe would compliment/go well this vanilla cake recipe? Or can I add chocolate/cocoa to this vanilla recipe? If so what would the quantities be and would I have to change the rest of this recipe? Thank you. This would be my perfect chocolate cake. SUPER moist! If you are combining a chocolate cake with this vanilla one though, I might try the chocolate cake used here. It’s still wonderfully moist but a touch firmer. This is THE vanilla cake to make! After trying dozens of vanilla cake recipes for years I have been on the hunt for the perfect vanilla cake recipe. I had never found a moist cake that didn’t feel and look like a dense brick…Or taste bland, or taste just like a straight sugar cookie, or even worse taste just like a weird vanilla cornbread hybrid lol yes that’s happened before. The inside of this cake looks like a box mix, is flaky, and is the most moist! A++ flavor as well!!!! Thank you so much for helping me FINALLY find the worlds perfect vanilla cake recipe! Such a great recipe! Finally a Vanilla cake that the whole family enjoyed. I’m so glad to hear that! Thanks Jen! It’s funny that you said “taste just like a weird vanilla cornbread hybrid” because I made another recipe for cupcakes and they truly tasted like cornbread lol. May I ask mam what kind of pastry tip did u used on the top of a cake ? What size ? Thank you very much and God bless .. I used the Ateco 844 closed star tip. Its ok if duble your recipes cakes ? I would think it’d be fine. What could I use instead of shortening for the frosting? Am going to be using your recipe today to bake a layer birthday cake for my roommate. Am using a 9″ pan can this recipe be sufficient for two 9″ inch pan. Cos it said here that you used three 8″ pan. And i want to ask if the milk to use is Evaporated or Fresh milk? Thank you for sharing your recipe. Makes it all so easy. Safe delivery and Gods speed to you. Yes, two 9 inch pans should be fine. I use regular 2% milk. Enjoy! What do you think about using cake flour instead? I haven’t tried it to know how it’d turn out. You could certainly try it. Hello! How long would you bake the cake if I were to use a 9×13 pan? This looks delicious! In doing a test run today so I can be it for my mom’s birthday! Can’t wait!! Thank you! I’m not really sure. I’d try somewhere between 25-30 minutes. Hi I have a question ???? for the frosting, when you say shortening is it vegetable shortening or butter flavored shortening? Hi Lindsay! I’ve tried this vanilla cake recipe. It is so perfect! 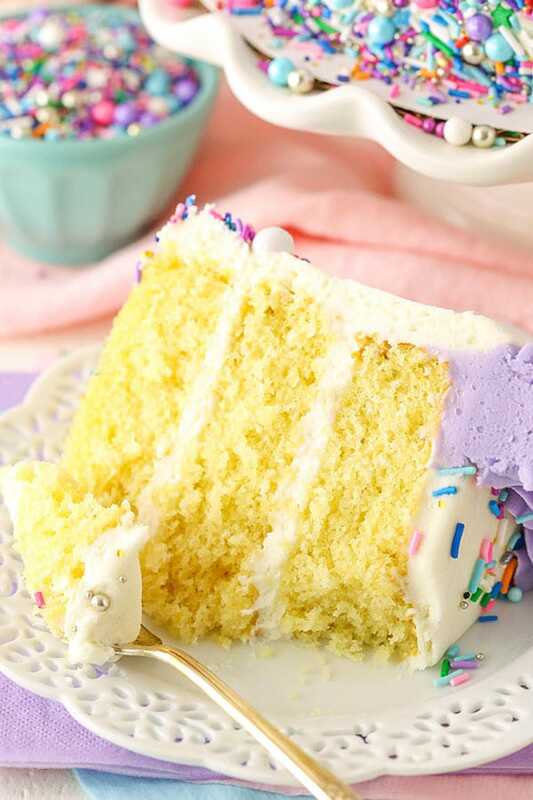 I also love your other vanilla cake recipe but this one is just wow! I also used it for cupcakes and they were amazing. I’ve been searching for the perfect vanilla cake and cupcake recipe. And this one is definitely a keeper. I love your work. Thank you for sharing it. ???????????? So glad to hear you enjoyed it! Thanks Lyn! I followed the recipe and this cake turned out incredible! This will be my go to vanilla/ birthday cake. Thank u! My family loved it . So glad to hear that! Thanks Dianne! OMG, I finally found a moist yellow cake!!! The flavor of the cake is amazingly delicious!! I had my doubts??? You proved me wrong! Thank you Mrs. Lindsey!! This recipe went straight to the front page of my recipe album!!! I’m so glad to hear it! Thanks Steven! I just made this cake and it came out wonderfully. I baked it as a single layer in a ten inch pan and it still came out great. may I use Buttermilk in the place of whole milk? I didn’t try that in this cake yet, but it might be fine. I made this amazing cake and wanted to tell you it came out just wonderful! Thank you for sharing your incredible recipes. One question: I need to make two 10 inch cakes. How much batter do I need to use if I use this recipe? Thank you again for all your help. I’m so glad you enjoyed it! I haven’t made 10 inch cakes, so I’m not sure exactly. You could probably double it. This cake looks really delicious. Does the cake have to be baked immediately after the batter is mixed? I have only two 8 inch cake pans and was wondering if I can make the batter in one go and bake them in batches? Baking them in two batches should be just fine. I just made this cake yesterday and followed the recipe. It came out very dense, hard and not fluffy at all. What could have went wrong? Tough to say from a distance. There are any number of factors that could affect things. I find that a common one though is not fully creaming the butter and sugar together. I’m sorry you had trouble with it! Just watched the video and it may be my mistake, but I don’t see you adding any eggs!! Unless of course you just edited that out….thanks for checking it out. Yep, looks like it got edited out. I’ve let me video person know. Thanks Chandra! I just made this cake yesterday and it came out beautiful! I must say cream your butter sugar oil well and the rest are pretty straightforward. Thank you Lindsay for being so kind to share your recipes! One question, if i am going to make a lemon flavoured cake using this recipe, would i reduce the amount of milk to 180 ml and add 120 ml of lemon juice? Would that work? I’m so glad you enjoyed it! I’d need to test it with lemon juice to say exactly. The acidity makes a difference. If you’d like a lemon cake, I might suggest this one. The recipe is relatively similar. why did my cake turned out so flat?? It’s hard for me to say without any context. I have some friends who are lactose-intolerant. Would you say this cake would turn out fine by using oat-milk and almond-butter? Hmm, not sure. Swapping out the milk would probably be fine (though it’d change the texture of the cake a bit). But I’ve never tried almond butter in place of butter, so I’m not sure about that. I was excited to make this cake, but it sadly turned out tasting like cornbread. Hi, this cake looks wonderful, wondering if it can be made into a 4-layer cake, with thinly sliced layers? You could do 4 layers. I suggest baking 2 and then cutting those in half. I am in search of a white cake recipe. I couldn’t find any on your site, so 2 questions 🙂 One could I do the above cake but instead of using the whole egg, just use egg whites, so it’s a “white” color? I’ve made this recipe several times and it’s a huge hit. 🙂 2nd question, if that doesn’t work, do you have a go to white cake recipe? Thank you so much for your time. I’m so glad you’ve enjoyed the cake! Unfortunately, this cake will not work with egg whites. The cake layers in this recipe though are fairly white and are similar to this cake. I hope that helps! Holaaa! Yo me traduje la receta de los cupcakes q se hacen usando sólo claras y son los mejores que he probado, mis amigos y familia opinan Igual! Nunca imaginé q usando sólo claras serían tan ricos ! Hey Lindsay i was curious have you ever used imitation vanilla on any of your cakes??? I usually use regular vanilla extract, but imitation vanilla should be fine. 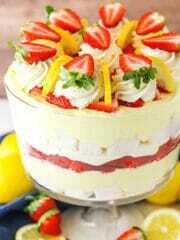 I would like to make a 2 tiered cake. one would be this recipe and the other chocolate. Any recommendations for which chocolate cake recipe would work better and do you think these cakes are sturdy enough to tier? I don’t do a lot of tiering of cakes, but I’d this one should be fine. For the chocolate, you could try the layers of this cake. I will also be sharing a chocolate version of this vanilla cake soon, which would work. To make the adjustment, reduce the flour to 1 3/4 cup (228g) and add 3/4 cup (85g) of cocoa. Then swap out the baking powder and use 1 tsp of baking soda. The instructions are pretty much the same, just with the swaps. I hope that helps! 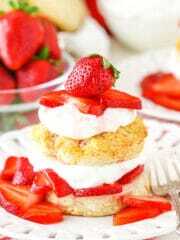 Yummy, this cake is so spongy can’t believe it. Thanks the recipe is easy to follow and yes don’t chinks on the creaming method. Hi Lindsay, after so many attempts to smooth my cake, I stumbled across your smooth a cake link. Which led me to many of your recipes. 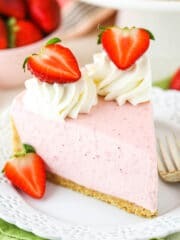 I was wondering if I was using this recipe to make a tier cake and using 6 inch pans how would I distribute the batter and how long would they bake for? Thank you. I haven’t really made 6 inch cakes, so I’m not familiar with the baking times. I’m sorry! I hope you enjoy the cake though! Thank you Lindsay for this moist vanilla cake recipe. I’ve been searching for one just like yours. Believe it or not, this is the third cake I’ve been baking today! The first two were just dense and no good at all. I’ve tried cake flour, buttermilk, oil only…they all flopped. This one is the one! Thanks so much! Wonderful to hear! Thanks Irene! Hi! Thanks so much for sharing this recipe looks amazing! I was wondering if I could put dulce de leche (the caramel-like spread) in between the layers and frost everything else with the frosting. Will the cake hold up? Thanks! Do you know if the cake keeps well in the fridge? I tried a different recipe last night and it came out fluffy and moist. But a night in the fridge got it all dense, despite bringing it to room temperature! I’m not sure that I’ve actually refrigerated it yet to be able to say for sure. I do think cakes are best at room temperature, but I would think it’d be fine refrigerated and then brought back to room temp. Hi Lindsay, just wondering how far in advance you can make this cake ie bake Thursday for party on Saturday and is it suitable for freezing? Thanks. Thursday for Saturday should be ok, but I wouldn’t stretch it any longer than that. It should be fine for freezing. Would this cake work with food colourings as a rainbow cake? Wonderful! So glad it was a hit! Does this cake freeze well? I would like to make it ahead of time and only put it together the night before an event. I don’t think I tried it yet, but it should freeze fine. I just recommend wrapping it well and defrosting in the fridge. You could definitely cut it down if you are more conservative with it. Also, here’s a post I did on frosting consistency that might be helpful. I was wondering if you tested this cake under fondant. If you did, does it hold it’s shape well? I haven’t tried to be able to say. I’m sorry! So glad to hear you enjoyed the cake! I did mean 12 cups. It’s a pretty standard amount for a decorators buttercream, but you can definitely reduce it as you did and still have success. It’s just a matter of how thick you want the frosting. I will try this one. May the baking gods look favorably upon me. I hope you enjoy it, Pam! I just made this cake after weeks of going through your recipes and trying to decide on a great “starter cake,” Welp this one turned out PERFECT! The recipe is easy and very tasty! Thanks for such a well thought out cake for any occasion or for anyone like me who just simply loves to have a cake in the kitchen. I’m so glad you’re happy with it! Thanks Tyra! I made this recipe for my daughters cake and cupcakes and received so much amazing feedback. It made me so happy! I am wondering if I could use this vanilla cake but somehow turn it into chocolate. Is it possible? Thank you! So glad to hear that! I actually have a chocolate version of the cake layers here. This recipe looks great! I am hoping to use it to make a ‘funfetti’ type celebration cake. Do you think adding sprinkles into the batter before baking would be ok? How could this be changed for high altitude? I’m not really familiar with high altitude changes. I’m sorry! Great question! I actually just bought myself a pan that size to be able to test it. I don’t know yet, though! Have you tried the 12 x 18 yet? Yes, you can find the sheet cake here. I made the cake only portion 2 days ago and wrapped the layers in plastic once cooled so I could frost today. The cake now seems dense and a little dry. Do you think this is because I did not frost it right away? It still has great flavor! I’m making it for a friend’s birthday. Thank you! Hmm, two days could have been a little long. Were the wrapped layers in an airtight container or anything? I feel like sometimes plastic wrap isn’t totally sealed. But definitely I think cakes do better when frosted. I’ll often make the cake layers the night before I want to frost them. You could always refrigerate the layers or freeze them ahead, but I also tend to think that dries them out. Finally found it ! I tweaked it a little. (Secret) but sour cream instead of oil makes it better for swallowing . It wasn’t dry or anything.. just a little bready! ! Halved it both times for testing . Such a simply recipe. Good job. I’m so glad you’re happy with it! I definitely love adding sour cream too. Hi Lindsay, Would you know if I could bake this as one cake (i.e. no layers), in an 8″ pan? if so, could you please advise if I would need to adjust quantities, and what would be a good cooking time? Many thanks. I wouldn’t recommend baking all the batter in one pan. It’ll take much too long to bake and you’ll end up overcooking the edges and undercooking the center. As for the sprinkles, I don’t have a special secret really. 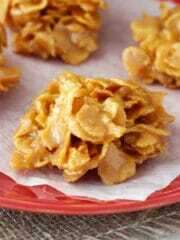 I just use handfuls and press them into the sides, starting at the bottom and working my way up. It can help to set the cake over a cookie sheet or something to help catch the extra sprinkles as they fall. I’m so glad you enjoy the recipes! Thanks! This is such a lovely cake. I will definitely add this delectable cake to my menu as I am running an online cake shop. I am sure customers would love this. 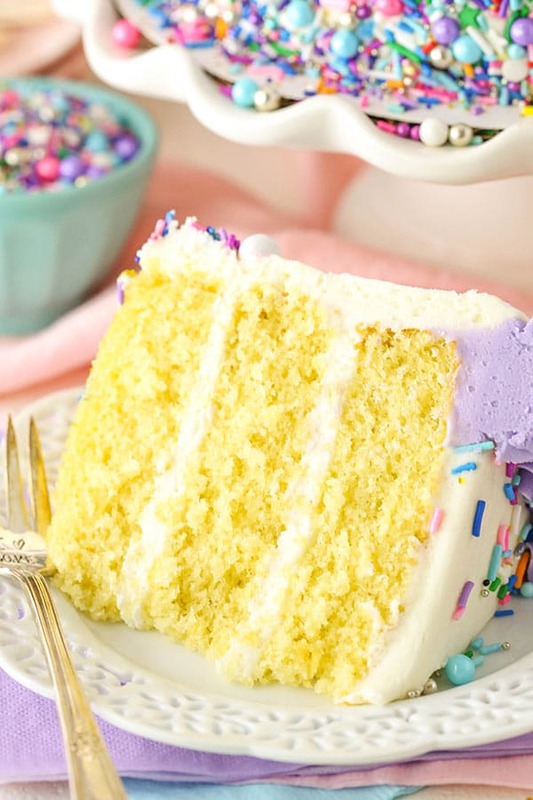 I’ve been dying for a moist and fluffy flavorful vanilla cake and this might be it. Only change I made was subbing reduced fat sour cream for the milk because I wanted something really moist. The flavor was so delicious on this (often lacking when I go for an oil based vanilla cake as I’m desperate for the moist texture). This was just a test cake so I saved a layer to freeze (want to test the texture after) and the other half I dug into. Tomorrow to be the test to see if it remains moist, or if it was so good only because it was fresh out of the oven. Thank you Lindsay! I hope you enjoy it! Thanks Anna! Anna – how did it go out of the freezer? Hello ! Is it possible to make just one cake in a 8 inch pan ? Because I just want to try this recipe and if it fails I don’t want to waste too much … Thanks. No, you’ll want to make at least 2 layers. But how can I bake a mini layer cake ? I would like to keep your recipe. Hello Lindsay ! I tried your cake today and it smells so GOOD. But why is the cake crumbling on the top ? And why are the edges so dark ?… I baked it at 180°C for abbout 30 min… thanks for answer. This recipe looks awesome! I’m going to be making this but i don’t have 3 cake pans is it okay to bake them one at a time? If so how much in each cake tin so I can measure the batter out? I think it should be ok. I don’t know exactly how much batter goes into each – I just divide evenly between the pans. I’ve tried various recipes from your website, and I love all of them, especially your no bake oreo cheesecake recipe. Such a hit with the fam! I was wondering, for this recipe, I intend to make dye it four different colours for each layer. Do you have any suggestions/things to look out for when dyeing the batter or would this recipe not be suitable for a rainbow layer vanilla cake? I’m so glad to hear you’ve enjoyed everything! This cake should work just fine to dye it, though I haven’t actually tried it before. I suggest using gel icing color for the dye. It’ll give you stronger colors without adding a lot of liquid – which would affect the cake. Thank you so much Neenu! Glad to hear you enjoyed it! This is easily the best vanilla recipe I have made! Hands down. Id like to know how you recommend storing this cake? Fridge or room temp? In your experience, does it freeze well and how far ahead can you make it? I’m so glad you enjoyed it! I like to store it at room temperature, since that’s how I like it served and I think refrigerating can dry it out sometimes. I’m not sure if I’ve frozen these layers before. I think so and if memory serves, they did fine, but I always prefer a fresh cake. It can be really hard to say from a distance what happens. Are you sure that you fully creamed the butter and sugar together? I halved the recipe and divided evenly in two 8″ x 1.5″ deep pans just to test cos I don’t have 3 pans and they were really flat. I’m going to make the full recipe and divide them into the two pans tomorrow and tell you how they turned out. I’m hoping it doesn’t rise too much and spill. It tasted great though. Thanks for the recipe. This is my go-to Vanilla ABC recipe! Super simple and great taste – I am really sold on using hi-ratio shortening combined with butter in ABC! Wonderful! So glad you’ve been happy with it! The chocolate cake and vanilla cake have different batter consistencies, they would not bake together well. I would recommend my Marble Cake. Fantastic recipe thanks so much!! Made for my daughter’s 3rd birthday and it came out so lovely and moist ans soft!! Hi there. For some reason my cakes are brown on the top but still raw in the middle. I followed the recipe with the correct oven temp and divided it evenly in 3 cake tins 8″ each. I have foiled them and waiting to see how they come out now, but have you got any tips for future to avoid this? I’m not really sure why that happened, I haven’t had that experience. This may seem like a silly question, but were the cakes sitting close to the top of the oven? I am planning to make a wedding cake. How long will your moist vanilla layer cake stay moist and tasty? I’d like to make the cake 2-3 days before the wedding and ice it with buttercream the day before. Is this possible? That should be fine. I recommend storing it out of the fridge and in an air tight container, 3-4 days at most. I love this recipe and have used it a couple of times now. It is my go to basic recipe. I am wanting to make this as a coffee cake. Can I just replace the vanilla for a shot of espresso? I’d leave the vanilla and add some instant espresso granules. You can dissolve them in the milk (warmed up). I’m not totally sure how much, but you could try a couple tablespoons. I honestly don’t have any tricks here, I just put some in my hand – sort of in my fingers, rather than my palm so I have more control – and press them against the sides of the cake. It’s very messy and sprinkles go everywhere, but it can help to set the cake over something like a cookie sheet so it collects some of the stray sprinkles. 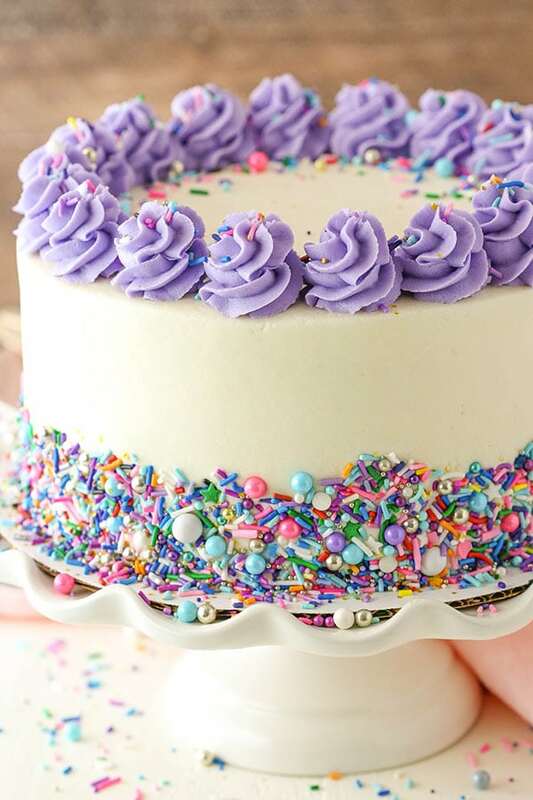 You will want to add the sprinkles right after you frost the cake, before the frosting sets. I hope you enjoy the cake! Made this as a wedding cake for our daughters wedding. Turned out beautiful. Great flavor, not to sweet. The buttercream was perfect. I find a lot of recipes can taste overly buttery but this one reminded me of store bought icing. We also made it into cupcakes for the guests. This will definitely be my go to recipe from now on. OMG!! I tried this recipe today and THE CAKE WAS AMAZING!!!! Hello, your a blessing… Please if am not using a salted bitter do I need to add salt? Yes, the recipe lists unsalted butter and 1/2 teaspoon of salt. I’d like to make this cake for my grand daughter’s 4th birthday which is on a Sunday afternoon. How far in advance can I make it? Will it be strong enough to support decorations for an ‘Elsa’ cake with chocolate shards & can I colour the layers? I think cakes are best if eaten within about 3-4 days. As far as supporting decorations – I don’t know exactly what you have planned, but some chocolate shard should be fine. 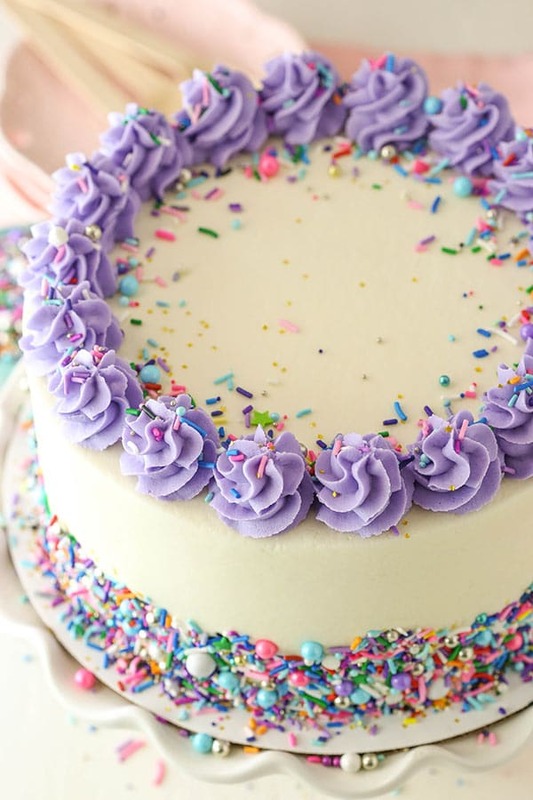 Coloring the layers should be fine too – I just usually suggest using gel icing color as opposed to food coloring so that you don’t add too much liquid to the batter. That sounds so festive! I’m so glad you enjoyed the cake! 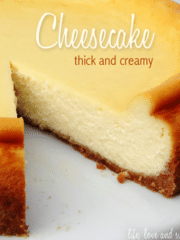 I absolutely love this recipe, it’s my go to for a layer cake! I’ve seen a few people ask on here, but I need to do a layered chocolate cake. Do you have a recommended recipe or could i just swap out certain ingredients? I’m so glad you enjoy the cake! Here is my recipe for Best Moist Chocolate Cake. Makes a lovely cake. Thanks for posting the recipe. One suggestion for the order of the steps: swap steps 2 and 3. This could help some people (like me today) avoid mixing wet and dry ingredients too early and not creaming the butter and sugar as intended. Recipe still worked out well though. You mentioned to bake cake at 175 degree. Since i am using a convection microwave (Morphy Richards), can you please confirm if I have to bake at the same temperature? I live in India (Asia) if it helps you give me some advice. I am really looking forward to try this recipe. I have never made a cake in a convection microwave and don’t know how it’d turn out. I’m sorry! Hi, I baked the cake yesterday and it turned out so great. It was delicious and moist and not at all sugary or oily. But my cake is very crumbled. I used the same ingredients excey that I added only 2 tbsp oil isntead of 3, also I added extra virgin olive oil. Can you please tell me where did u go wrong ? I really love this recipe but I have to understand why my cake is crumbled. I’m not sure what you mean by crumbled? Did it just not come out of the cake pan well? Hi Lindsay! Can I reduce the temperature to 300 or 325 degrees while baking this cake? Would the decrease in temperature affect its texture? It would affect the way it bakes, but I’m not sure exactly how it’d turn out. Hello, i am from UK and want to have a go at baking this cake, looks delicious!! For the sugar, is it Granulated Sugar or Caster Sugar i need to use? Granulated sugar is used for the vanilla cake. Powdered sugar is used to make the frosting. Hey. I was just wondering if when you say sugar you mean faster sugar? I use regular granulated white sugar in the cake. Do you have a link for those y’all cake pans? Does this solve the issue of hard edges you sometimes get from baking? I tried looking through comments but I didn’t see any mention. Thank you! I’m not sure which cake pans you are referring to or the hard edges. 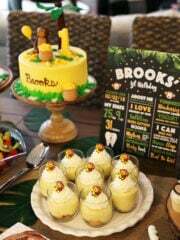 I used Wilton brand cake pans. I hope that helps! I like your idea how to make a soft vanilla cake. Hello, I made this back in September for my daughter’s 3rd birthday and cake was absolutely delicious soft and moist! i need to make it again but have totally forgotten whether i used plain flour or self raising flour as i am in the UK and we don’t have all purpose flour. I’m assuming it would be plain flour because it wouldn’t be self rising. Self rising already has leavening agents in it and all purpose does not, we add our own into the recipe. Hi, I only have 1/4 C of unsalted butter, is it ok if I use 1/2C salted, if even all of the butter salted and omit the 1/2 tsp of salt? Thanks! Yes, you can use salted butter and just leave out the salt. How many batches would you have to make for a 5 tiers cake? Hope you respond! Thanks!!! I’m really not sure, I’m sorry. I make buttercream frosting with 4 cups 10x sugar….holy Hannah 12 cups?? How many cakes are you making?? I use that amount of powdered sugar for a thicker consistency. Check out my post on standard buttercream! this was really such an easy recipe to follow and the cake came out wonderful and delicious. got so many compliments. thank you!!! Wonderful! I’m so glad you enjoyed! I made this for my husbands birthday. I wanted a moist, flavorful cake and got it! If you’re making cake from a box, throw it away. This is the only recipe you will need for a perfect yellow cake. I paired this with Hershey’s rich chocolate frosting recipe. Happy baking! Love this recipe!! I would like to know if I can frost the cake a night before and leave in the fridge? Or should I leave it at room tip with frosting already on the cake?? Yes, you can frost the night before. I like to store it at room temperature in an air-tight container, since that’s how I like it served and I think refrigerating can dry it out sometimes. Hey Lindsay, what would I need to change to make this recipe for 3 – 9″pans? Also, is there a recipe for chocolate frosting? I’m not sure on the baking time since I haven’t used 9 inch pans for this recipe. Keep in mind the layers won’t be quite as tall. For the frosting, you could use the chocolate frosting in this recipe or the Fudgy Chocolate Buttercream Frosting. I hope you enjoy! I love the cake idea, but I was wondering whether I could use a different frosting recipe? Sure, different frosting would be fine. I haven’t made 10 inch cakes, so I’m not sure exactly. You could probably double it. I feel like this question is hard for me to answer since I don’t really make stacked cakes. I’ve only made a handful of them ever and it was years ago. It’s a softer cake, so if you are going to use fondant and want it to hold it’s shape and corners, using ganache under the fondant would be best. If you are ok with rounded corners, buttercream underneath would be fine. I would think it’d be fine for stacking. I just baked a cake with this recipe. It came out really nice. Thanks for this. I’m in cake heaven right now! 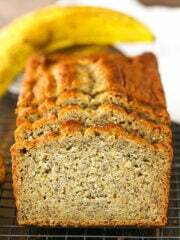 Hi Lindsay I was wondering if I use cake flour in this recipe would it still be the same outcome. Yes, I believe it’d be fine. I’m so sorry for the trouble! There was an issue today that affected thousands of sites – mine included. It looks like it’s been resolved, so you should be able to access it here now. Sorry about that! Hey Lindsay, I made thisc cake for a several times but never wrote it down. Now I want to bake it once more but I don’t see the recipe. It’s really gone. Instead of the recipe I see a lot of letters, /// etc… Can you please help me? Thank you! Now I can see it indeed! I began to worry a little bit because I want tomake it tomorrow for a birthday for a daughter of my friend but thought now I need to do something else. Tomorrow after baking I will write it down 🙂 Really great recipe! I used this as a base for my Strawberry Crunch cake, and this cake came out perfect. I used buttermilk instead of regular due to the sugar content of everything else I using on top of the cake but omg it was so fluffy and baked to the perfect height. Definitely using your recipe from now on! That’s so great to hear! Glad you enjoyed it! Hi Lindsay. If I add some chocolate chips or rainbow drops with this cake would it be fine? Chocolate chips would sink to the bottom, I believe. And as for a rainbow cake, I actually adjusted this cake a little so that the layers don’t mix. It’s my Rainbow Swirl Cake. HI! I am going to try to make this cake for my daughters 6th birthday. We use 1% milk can I use it for this recipe? Yes, that’ll be fine. I hope you enjoy it! Really simple and very yummy cake. Saved your recipe for future.